Today, Hayley and Liz and I went to the Hebron Baptist Church for Easter services. 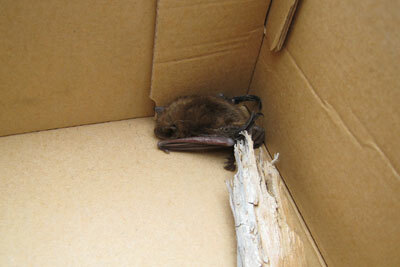 Before the service started I found a small brown bat lying in the parking lot. It was freezing cold out and at first I thougth he was dead, but then I noticed he was breathing. Hayley scooped him up with a piece of plastic and deposited him in an old Ugg shoe box that Liz had in her car (ha ha, Liz has Uggs). After church, we took the bat to the wildlife center in Waynesboro. They said he seemed OK and that they would fatten him up and then release him. Apprently, the weather we are having (really warm out and then suddenly really cold) causes a lot of problems for bats, because they unhibernate, innocently enjoy the high temperatures, and then turn into little bat popsicles when the temperature unexpectedly drops. Poor bats. I have named the bat Hebron. Interestingly, or not, depending on your point of view, Hebron is not the first bat I have found. Once when I was little I was walking in Central Park with my mom and I saw a small brown bat lying on the ground. He seemed hurt and we did not know what to do. My mom wanted to kill him, because she thought he was suffering, but by this time a small crowd had gathered and they were against any type of bat murder. It was decided that my mom and I would stay with the bat while another man went to find a park ranger. As we were sitting there, watching the bat, he suddenly got up, scampered a few feet, and then flew away. We were quite happy at this turn of events, but soon grew concerened that when the man and the park ranger returned, they would think we had killed the bat against their wishes. We waited a while but soon became bored (because there was no longer a bat to look at) and wanted to leave. So, we left a note on the ground that said “Mr., the bat flew away.” I think we also drew a picture of a flying bat. I have no idea if the man ever returned and found that note, but if he did, I hope he believed it.